Deceit, ambition, pride, honor, bravery—all played their parts in 1187, with Jerusalem and the Holy Land at stake. The Saracen host commanded by Saladin—Sultan of Egypt and Damascus—crossed the Jordan River south of Lake Tiberius (the “Sea of Galilee”). Saladin, a most formidable warrior, knew he faced a fierce but cautious enemy. He had to provoke the Crusaders into attacking rashly, and he had to do it quickly. He marched his army to Kafar Sebt six miles southwest of the castle and town of Tiberius. His men would not tolerate a long campaign without fighting. It was now high summer, 1187. At best, the army would remain together only until winter came. To try to provoke an advance, he sent part of his army on a series of raids. Still the Crusader army of the Kingdom of Jerusalem waited at the ruins of the town of Sephoria, 15 miles to the west. Despite the raids, the enemy army did not move. The castle at Tiberius was home to Raymond III, Count of Tripoli, the man Saladin believed was the true leader of the Crusaders. The Countess of Tripoli held it with only a handful of men. On July 2, Saladin detached a small force to raze the town and lay siege to the castle. Then he waited for the Crusaders to react. With luck, he would crush them. The Crusaders’ presence in the Holy Land was the result of the brutal campaign of the First Crusade. After the capture of Jerusalem in 1098, they had established four independent states in Asia Minor stretching along the Mediterranean coast from Antioch in the north to Gaza in the south. In 1144, the Crusaders’ County of Edessa fell to Zengi of Moab. Internal fighting among the Crusader leaders aided the Saracens—the Prince of Antioch refused to send help, and by the time a relief column from the Kingdom of Jerusalem arrived, it was too late. A Second Crusade tried to reconquer Edessa, but failed. One factor which greatly aided the Crusaders during the First Crusade and the early years of their states was the habit of the Saracen leaders to make war upon each other instead of the invaders. Zengi’s ambition was to be Sultan of Damascus. He spent most of his life fighting other Saracens. His second son, Nur al-Din, succeeded where he failed. In 1154 he became the Sultan of Damascus. While he continued to war on his fellow Moslems, he also planned to attack the Crusaders. He had a pulpit built, which he planned to use when he conquered Jerusalem. Although he was the sultan of the richest city in the Mideast, Nur al-Din led only a small part of the Islamic people. Besides being broken into various city-states—often at odds one with another—Islam was also divided into two religious factions, the orthodox Sunnis and the Shi’ites. A century before, a Shi’ite movement swept across north Africa from Tunisia. At the time of Nur al-Din, Shi’ites ruled Egypt. Despite this, when threatened by an invasion by the Crusaders, the Caliph of Cairo asked Nur al-Din, a Sunni, for help. Nur al-Din sent a large army under the command of his lieutenant, Shirkuh. Shirkuh’s nephew Saladin accompanied the army. Saladin assassinated the Egyptian vizier within a few days of their arrival. The caliph appointed Shirkuh to replace him, and when Shirkuh died a few months later, Saladin became the vizier. Saladin was a man of contradictions. Born an Armenian Kurd, he unified the Arab world. A scholar and slight in stature, he was the preeminent military leader of his era. Unlike his predecessors, he enjoyed the loyalty of people of different lands. When the caliph’s Sudanese and Nubian troops rebelled, Saladin massacred them leaving the caliph at his mercy. When Nur al-Din appeared ready to invade Egypt, Saladin deposed the caliph, replacing Shi’ite leaders with Sunni leaders. By this stroke he made himself the champion of orthodox Islam. When Nur al-Din died in 1174, his heir was his 11-year old son. Saladin at first supported the boy, but the empire began to unravel for want of strong leadership. When war appeared about to erupt between rival factions in Damascus and Aleppo. Saladin marched north to seize Damascus. The boy heir supported the governor of Aleppo against Saladin. When Saladin won the battle, he claimed the sultanate for his own. While Saladin unified the Islamic world, the situation within the Crusader states grew worse. In a feudal society, the king had few knights reporting directly to him. He counted on his liegemen to provide knights (and foot soldiers) when the need arose. The backbone of the Crusaders’ power derived from the military orders of the Templars and the Hospitallers. Being religious orders, they were required to take commands only from the Pope. Without specific papal instructions, each order followed its Grandmaster. The king needed the support of both Grandmasters to fight. Commanding the Crusader army in 1187 was Guy of Lusignan, King of Jerusalem. Guy had few attributes that justified his leading the army in battle. He lacked military skill and insight, was a weak and vacillating leader, and did not have an undisputed claim to his crown. In fact, Guy became king only late in 1186 by means of a palace coup. His coronation united important factions within the kingdom while alienating others. One of Guy’s strongest supporters was Reynald of Chatillon. Reynald came east to join the service of the Prince of Antioch. When the prince was killed in battle, his widow Constance married Reynald. He soon showed himself to be both a poor administrator and leader. He launched a war on the Byzantine Empire to the north but had to surrender when besieged by a much larger army. When captured by the Saracens and held prisoner in Aleppo, no effort was made to ransom him. After 16 years, he was released. With Constance now dead, he married Stephanie of Kerak, gaining the fortress of Kerak of Moab. Southeast of the Dead Sea, it was the most exposed of the Crusader castles. It also threatened the caravan routes between Damascus and Egypt. Just to keep the routes open, Saladin had to shift forces back and forth between Egypt and Damascus. Once in Kerak, Reynald immediately embarked on an ambitious plan to strike at the heart of Islam by sacking Mecca. A day’s march from Medina (an Islamic Holy City) Saladin’s brother al-Adil captured or killed the raiders. Only Reynald escaped. Because Saladin had frustrated this attack on the Islamic holy cities, more people proclaimed him the champion of Islam. Moreover, Saladin swore he would kill Reynald for what he had tried to do. As much as Saladin hated Reynald, he respected and trusted Raymond III, Count of Tripoli. Like Reynald, Raymond had spent several years as a prisoner in Aleppo where he learned Arabic. Upon his release, he twice served as regent to the Kingdom of Jerusalem at times when the crown princes were minors. Raymond’s situation was peculiar. Although lord of the independent County of Tripoli, as the lord of Tiberius he was also vassal to the King of Jerusalem. Raymond, more than anyone else, recognized the fragility of the Crusader situation in the Holy Land. As regent in 1185, he negotiated a four-year truce with Saladin. A severe drought had ravaged the Crusader lands for two years. The weak economy of the kingdom could not support an army in the field. At the same time Saladin learned of a plot by his relatives to depose him. The two agreed to the truce, each looking for time with which to solve his internal problems. Some Crusader leaders so opposed Raymond’s efforts to maintain peace with the Saracens that they united against him. They rallied to Guy of Lusignan. The last of the male heirs to the throne of the Kingdom of Jerusalem was Baldwin V, who died in September 1186. The man with the strongest claim to the crown was Guy of Lusignan who had married the sister of Baldwin IV. Baldwin saw that his brother-in-law lacked the qualities needed to be king. He disinherited him and forced the Crusader nobility to swear an oath to adhere to that. Despite their oath, those opposing Raymond crowned Guy King in November 1186. Reynald opposed Raymond because of his willingness to negotiate with the Moslems (and possibly because his wife blamed Raymond for the death of her first husband). Gerard of Ridfort, Grandmaster of the Templars, had been a retainer of Raymond. As he steadied the crown on Guy’s head at the coronation, he was heard to mutter that he had gotten revenge on Raymond for reneging on the promise of marriage to a wealthy woman years before. Guy’s first act was to aggravate an already bad situation—he demanded that Raymond account for monies spent as regent. Raymond officially broke relations with the Kingdom of Jerusalem and returned to the County of Tripoli. Meanwhile Reynald did not accept Raymond’s authority to make a treaty with Saladin. In November, he looted a caravan passing Kerak. Saladin offered to ransom the captives but Reynald refused. The Saracen leader captured a boat of pilgrims and offered to exchange them, but still Reynald refused. In desperation Saladin appealed to the King of Jerusalem. Guy asked Reynald to release his captives but Reynald still refused. Saladin now had an excuse to end the truce. He summoned troops from all over the Mideast to invade the Kingdom of Jerusalem. Saladin’s first act was a diversion to the north. His nephew, Taki al-Din, demonstrated against Antioch to hold the Crusaders of the northern state within their own land. When the demonstration was complete, Taki al-Din marched his army south to join his uncle. Saladin meanwhile had divided his force. He believed Reynald was about to attack another caravan passing near Kerak, one in which traveled some of his relatives, including the son of his sister. Such a move could keep the Egyptian army from joining his. Taking part of his army, Saladin rode 50 miles east of Tiberius to Busra to protect the caravan. He ordered his son al-Afdal to take the rest of the army toward Jerusalem. When the caravan had safely passed Kerak, Saladin again swore he would kill Reynald, this time with his own hands. By the spring of 1187, even Guy recognized how desperate the situation had become. Saladin had united large areas of the Mideast. To wage war on the Crusaders, he summoned Arabs, Turks, Kurds, and Egyptians to his banner. Guy realized he needed Raymond’s help. To make peace with him, he ordered Balian of Iberlin to lead a delegation to Tiberius. Among them was Reynald, Gerard, Roger of Les Moulins, Master of the Hospitallers, and Heraclius, the Patriarch of Jerusalem. Reynald rode alone by a different route. The others halted at Nablus where Balian found his wife. Since they would be riding only a short distance to al-Fule the next day, he decided to spend another day at Nablus. In the morning, accompanied only by his squire, Ernoul, he started out. Remembering it was the Feast of St. James and St. Philip (May 1), he stopped at Sebastea two miles from Nablus to hear Mass. Upon arrival at al-Fule he found the Hospitaller house empty. Ernoul searched the castle but found only two sick men who did not know what had happened. They continued toward Nazareth when a Templar overtook them with news that Gerard and Roger with a force of knights had attacked a larger Saracen force and had been annihilated. The story ran thus. Under the terms of the truce, Raymond had to allow the Saracens into his lands. Al-Afdal, a son of Saladin, asked Raymond to allow his force to pass through on its way to Jerusalem. This request put Raymond in a quandary. He was afraid that if he said no, Saladin would use that as an excuse to attack his lands. In the end, Raymond agreed to allow a force of seven thousand Saracens to enter his lands as long as they attacked no one and left within one day. To ensure that no incident occurred that could lead to war, Raymond sent messages to all castles and towns in the area warning the people of the approach of the Saracens. If the people remained in their towns, he believed al-Afdal would honor the terms. As soon as Gerard and Roger received Raymond’s message, they decided to attack the Saracens. Gerard had with him 10 Templars, and there was an outpost of 90 Hospitallers nearby. On their way, they collected the garrison at Nazareth. At the Springs of Cesson they attacked, 140 knights and a handful of foot soldiers against seven thousand. The sudden attack by the Crusaders caught the Saracens by surprise and gained the initial advantage, but by sheer number they overwhelmed the attackers. Roger and most of the Hospitallers and Templars were killed. All others were captured except for Gerard and a couple of Templars. When the Saracen force approached near sundown, Raymond thought he had avoided a dangerous situation. The Crusaders watched as the Saracens paraded past the castle. Then they saw that the Saracens had mounted the heads of the dead Templars and Hospitallers on their lances. Raymond realized that this time he would not be able to negotiate peace with Saladin. Now the Holy Land likely was at stake. Raymond went to meet Guy at Saint-Job, near Jenin. As the Count of Tripoli approached, King Guy dismounted first. Raymond knelt at his feet to swear fealty. The Crusaders were finally united. The Crusaders gathered at Acre on the coast. The Count of Tripoli brought most of his men, the Prince of Antioch sent his son with 50 knights, and the Templars and Hospitallers brought most of their knights. To this force was added Moslem mercenaries and several hundred knights and thousands of foot soldiers. The Templars armed the latter with money from Henry II of England, given to atone for the assassination of Thomas a Becket. The Patriarch of Jerusalem sent the “True Cross” to give spiritual aid to the Crusaders. Although the bulk of the Crusader army was made up of foot soldiers, victory was normally decided by the men on horseback, knights wearing chain mail and Norman helmets who charged in a massed formation. 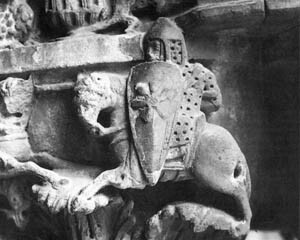 Next to the lance, the Crusaders’ principal weapon was the three-foot broadsword. The Saracen army consisted of lightly armored men on small, fast horses. Their tactic was to soften up the enemy with arrows fired from hundred-pound bows, then to attack with lance and scimitar. 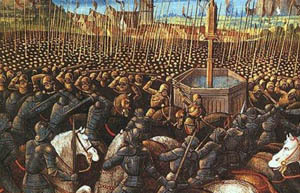 In close combat, the Crusaders were at an advantage due to the weight and power of their massed formations. When faced with a charge by knights, the Saracens would fall back, then try to overwhelm them from all sides with sheer numbers. Saladin had a definite edge in numbers with 12,000 horsemen and about 18,000 foot soldiers. The Crusaders had about 1,200 mounted knights and between 12,000 and 15,000 foot soldiers. Unfortunately, to field such a large army, the Crusaders had to strip their castles of defenders. Thus if Saladin defeated the army, there would be no one to defend the cities and castles. While the Crusaders moved in late June toward the Springs of Sephoria, about halfway between Acre on the sea and Lake Tiberius, Saladin called a council of his emirs. Most advised against battle but he overrode their advice. He wanted one battle immediately to determine the fate of the Holy Land. The Crusaders maintained a series of castles along their eastern border with the Saracens, each too strong to be bypassed by an invading army. The Crusaders’ strategy was to hold a besieged castle until their army could come up from Jerusalem to raise the siege. At vespers on the evening of July 2, Guy received a communiqué from the Countess of Tripoli, Raymond’s wife. She wrote that the Saracens had besieged the castle at Tiberius where she was staying and appealed to him to come and rescue her. Guy called a council of war. Inside a tent, bitter enemies met to discuss what course of action to take against the Saracens. The radical faction, led by Gerard of Ridfort and Reynald of Chatillon, wanted to attack. These Crusader knights believed it was their duty to try to rescue the Countess of Tripoli. The man who had the most to lose with the fall of Tiberius, Raymond took the opposite position. “I am about to lay before you advice which will surprise you, but I offer it with the greater confidence from its being opposed to my personal interests.” He argued they should stay at Sephoria where there was ample water, knowing there was none on the route between Sephoria and Lake Tiberius. He did not believe the Saracens could maintain their siege before a lack of supplies forced them to retreat. Even if Tiberius fell, he knew he could ransom his wife back from the Saracens. Gerard interrupted Raymond several times, reminding the lords that Raymond recently had negotiated a truce with Saladin and continued to question the count’s loyalty. The vacillating King Guy initially sided with Raymond. The army would remain at Sephoria. Later that night, he changed his mind after Gerard of Ridfort went to his tent. The Templar’s Grandmaster had already shown himself to have more valor than common sense. Late on the 2nd he persuaded Guy to march to the relief of Tiberius. The next morning the Crusader army began a march across the hot and arid desert toward Lake Tiberius. The army marched in three units. Raymond, reluctant but loyal, commanded the lead while Guy commanded the center. With Guy were the Bishops of Acre and Lydda carrying the True Cross. Balian of Iberlin and Gerard commanded the rear unit of which the Templars were the main part. Saracen skirmishers attacked as soon as the army left Sephoria. The Templars continued to fight them throughout the day so the army could continue forward. Continuing attacks on the rearguard forced the army to move slowly so the Templars could keep up. Then the heat began to take its toll on the men in armor. There was no shade along the route, and they soon exhausted the small amount of water they carried in leather bottles. A march they should have accomplished in four hours took all day. The Crusaders now faced long odds. But they had the satisfaction of knowing that their forebears had fought overwhelming numbers before, winning amazing victories. A month after taking Jerusalem in 1099, Crusaders had defeated a much larger Saracen army near Ascalon. In 1101, Baldwin I defeated an army 30 times the size of his at the same place. In 1177, Baldwin IV had won a great victory at Montsigard. But in the years since Montsigard, the Crusaders had suffered two major defeats. As the van of the army approached Tiberius, the Crusaders saw smoke rising from the town in the distance. The nobles asked Guy for permission to press on to relieve the castle that day. Before he could decide, a message came from Gerard. The constant combat had so exhausted the Templars they could go no farther. Wanting to keep his army together, Guy made the fateful decision to rest for the night on a limestone ridge between rocky twin peaks known as the Horns of Hattin. Again, Guy’s lack of military judgment showed. Although the Templars joined him by nightfall, by camping where he did, Guy chose the battlefield for the next day. The hard lava bed below the Horns of Hattin was ill-suited to the Crusaders’ style of warfare. Only a few olive and fig trees provided any cover from the sun. During the night Saladin extended his lines to surround the Crusader camp. His men set fire to the dry brush on one side so that smoke covered the Crusader camp throughout the night. At dawn Saladin pulled back his lines, not wanting to start the battle until the day became hotter. He knew the enemy suffered from thirst. He intended to add heat as a weapon. In the morning, he rode through the ranks of his troops to encourage them to victory. The Crusader strategy was simple. They needed water so the main attack would be in the direction of Lake Tiberius to get it. After dawn, the foot soldiers moved forward in that direction. Saladin swung in troops to block their advance. One overly aggressive emir was captured by the Crusaders and beheaded. Saracen arrows ripped into the ranks, and the Crusader attack quickly faltered. Already demoralized by thirst and heat, half the foot soldiers surrendered immediately. The remainder retreated up the slope to evade the Saracen fire. They refused Guy’s pleas to descend and join the cavalry. Although the battle had barely begun, Guy realized it was already lost. Five of Raymond’s knights entered the Saracen lines, begging to be killed and put out of their misery. Probably at Raymond’s suggestion, Guy agreed to let him try to escape the Saracen envelopment. Someone had to escape to organize the defense of Jerusalem. The first attack by the Crusader cavalry was not in the direction of Tiberius which was their reason for being there, but back in the direction of Sephoria. Taki al-Din commanded that part of Saladin’s line. As the Crusader knights charged, he apparently recognized Raymond. He ordered his men to fall back. Raymond, Balian, and a handful of knights passed through the lines. Taki al-Din quickly sealed the hole in the lines. The Crusaders made two more attacks against the same spot, but no one else escaped. With the flight of the Count of Tripoli, Crusader morale plummeted. Crusader foot soldiers continued to surrender by the hundreds. Some of the heaviest fighting occurred on the slope where the True Cross was mounted. Even Saladin later commented that the men about it fought with vigor. When the Bishop of Acre was killed, the Bishop of Lydda tried to carry the Cross away but was captured. With the loss of the Cross, the Crusaders became vengeful. They believed their only chance for victory lay in slaying Saladin. King Guy personally led a charge of the knights toward Saladin’s supposed position. The armored horseman thundered forward, ripping into the Saracen ranks. The lines buckled, and for a while no one was certain whether they would hold. But Saladin organized a counterattack. It threw the Crusaders back. King Guy led another charge. Again the Saracen lines buckled, but a second counterattack threw the Crusaders back again. Now it was the Saracen’s turn to go on the offensive. The knights drove off attack after attack as they retreated slowly in the direction of Guy’s red tent, around which he and 150 knights made the Crusaders’ last stand. As the Saracens continued to attack, Saladin’s son al-Afdal remarked to his father that the battle was over. Saladin corrected him, saying that the battle would be over only when the king’s tent collapsed. Almost as soon as he uttered these words, the tent fell. Saladin dismounted and knelt to thank Allah for the victory. There was no formal surrender. The Crusaders were too exhausted to continue fighting. Those still on horseback dismounted and sat on the ground, waiting to be taken prisoner. Saladin had the three remaining Crusader leaders brought to his tent. He gave Guy and Gerard water to drink, but stopped Guy from passing the cup to Reynald. (Saladin would have had to spare Reynald’s life if he gave him a drink while he was a prisoner.) He asked Reynald to become a Moslem. When he refused, Saladin drew his scimitar and struck to behead him. Saladin’s bodyguard finished the work. Saladin ordered the execution of the Templars, Hospitallers, and knights of less than noble birth who could not be ransomed. He kept Guy and Gerard alive to further his campaigns. Saladin offered Guy and Gerard their freedom if they could persuade the Crusaders to surrender. The Templars had a policy of not ransoming captured knights, but Gerard interpreted this to refer to money. Despite the efforts of the two, the defenders of Ascalon refused to surrender. Saladin had to besiege it for a month before it fell. Shortly after the Saracens arrived at Jerusalem, Balian arrived under a flag of truce to evacuate his wife. Once inside the town, the people demanded Balian command the defenses. He discussed it with Saladin who agreed it was his duty to do so. With no knights in the town he created 50 knights by knighting the sons of knights and merchants. Balian knew the city could not withstand an attack. He finally negotiated the surrender of the city by warning Saladin that if he attacked, the people might destroy the Islamic holy site of the Dome of the Rock. The only city that remained in Crusader hands was the coastal city of Tyre. Conrad of Monteferrat took command of the defenses in July. Saladin released Guy and Gerard to create conflict within the Crusader camp. Guy continued to try to regain his kingdom while Gerard was killed when he refused to withdraw with the rest of the army. Thus Saladin conquered most of the Holy Land. But he enjoyed little peace. The fall of Jerusalem almost immediately instigated the Third Crusade to be led by Richard I (“The Lion-Hearted”) of England and Frederick Barbarossa. Saladin resisted until he died in 1193. Jerusalem remained under Moslem control until 1229. Tags Byzantine Empire, Cairo, First Crusade, Horns of Hattin, Islam, Jerusalem, Mohammed, north africa, Richard I, Saladin, Shi'ite, Sunni, Third Crusade, Tunisia.